There’s been a fair amount written about the Obama Christmas card. It’s a pop-up card, which has an expensive look that’s unseemly as millions lose their insurance and millions more have joined the ranks of the perpetually unemployed. It’s colors are cool, not warm, which seems to refute the warmth that Christmas brings to people in the dark of winter. It shows a vacant building, which seems symbolic when one considers that Obama invariable answer to all the scandals revealed in the past year is to disclaim knowledge or responsibility. And lastly, despite going out at Christmas time and despite Obama’s claims to be a Christian, the card makes no mention of Christmas. Keep in mind with this last point that the card ostensibly comes not from “the government” but from a man and his family. George and Laura Bush were not ashamed that they celebrated Christmas and always sent out cards that included Biblical verses. And speaking of nothingness, looking at the card, I find Obama’s signature striking. It’s an impressively artistic signature, with its bold and balanced capitals, but it’s also a very peculiar signature. Obama’s first name is given over almost entirely to a backwards bulging, open-bottomed “B.” After this impressive start comes a string of unintelligible letters. Even the “k,” which should be the upright punctuation to his first name has vanished. Obama’s last name is even more peculiarly written. The over-sized capital “O” envelopes the “b”, while the rest of the letters — “ama” — fade into a straight line of nothing-ness. And speaking of nothing-ness, think about that “O” for a minute: If you didn’t know better, wouldn’t you think that it’s the symbol for the “slashed zero” which is written that way in order to distinguish it from the letter “O”? When I was growing up, my father had discovered at some used-book store a “graphology” paperback that purported to tell you everything you needed to know about a person’s character simply by looking at that person’s handwriting. It’s definitely a pseudo-science, but I still can’t help but wonder what a graphologist would make of our President’s signature. Perhaps he’s been telling us all along that he’s a nothing, a zero, a cipher. 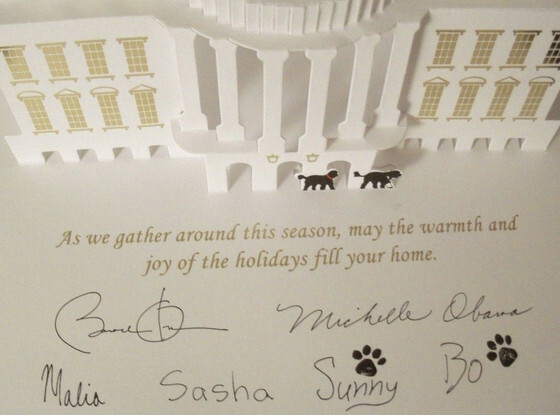 Considering the empty White House, the meaningless greeting, and that zeroed out signature, the Obama Christmas card is a peculiarly telling document. It goes out to America at the end of Obama’s terrible, awful, no-good, disastrous year, one that showed him to be an ineffectual liar whose signature accomplishment has proven to be a dismal failure, and shows every sign of getting even worse in the future. This is a nothing of a man, unable to inhabit the House that the American people entrusted to him, he celebrates nothing at all, and his signature is the giveaway that there’s never been anyone there to begin with.